It was so difficult to write yesterday’s post (due to the internet connection), I didn’t even get to talk about the awesome convention at the hotel. They were having a convention for Hobby Town! All sorts of vendors were there trying to get Hobby Town to sell their games, toys or gadgets. They were set up in the big hall and also in several rooms around the perimeter. I was too chicken to do more than peek in the rooms, but Lloyd told me later that he and Harold walked through the exhibition hall to see everything. When they were asked if they were with the convention, Lloyd said, “We’re just tagging along with our wives.” Sneaky, Lloyd. 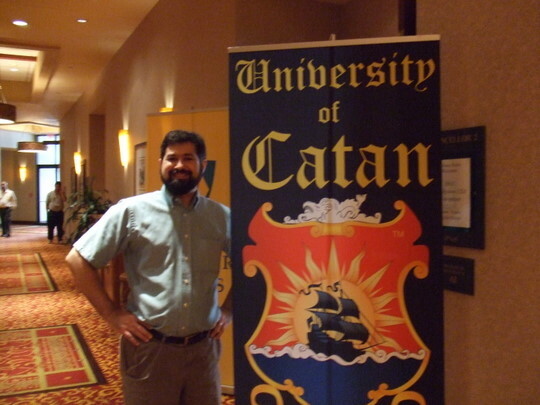 I asked if he wanted a picture by the Settlers of Catan room. He said ‘no’, but I made him do it anyway. The only way this could have been better is if we had been at a Fire Convention. That Settlers banner is cool! I wonder if you could have bought it for your game nights? I didn’t know Harold and Lloyd actually walked through the exhibit hall. Very cool… But maybe they should have said: “We left the kids up in the hotel room.” Then maybe the vendors would have given them stuff. 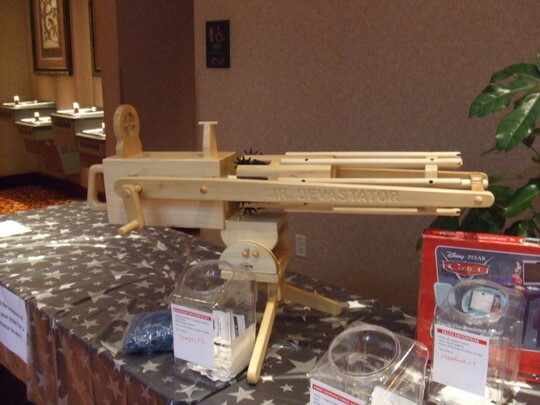 If that is the “junior devastator” rubber band gun, what does the “devastator” look like?